Pie bags There are 12 products. The cherry on the cake? It's the charm and refinement we brought to this very useful pie carrier!! It will carry your best pies in a feminine and practical vintage fashion. Simply I-RRE-SIS-TI-BLE. 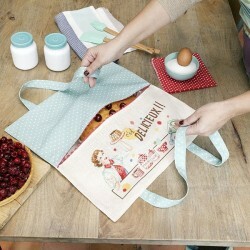 Here the cake bag, designed to carry around your delicious savoury or sweet home-made delicacies. It will be a good hiding place to keep your wares safe from the prying fingers of food lovers ! Of course! 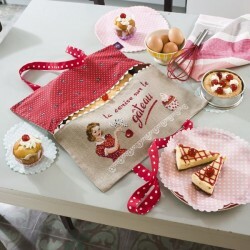 This pie bag with 50's style is simply delicious! 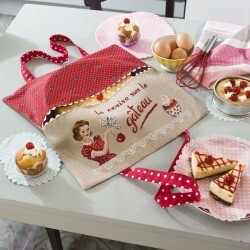 We can imagine you proudly carrying one of your home-made goodies in this witty and practical bag. Because you're as good in the kitchen as you are at stitching! A deliciously delightful embroidery! 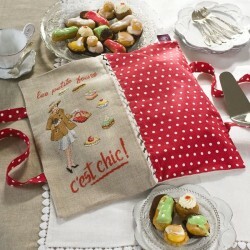 Such elegance for transporting your yummy cakes, macaroons or tartlets, fruit cakes or florentines. Make friends for life? Offer the container and the contents! The large size, 39 x 39 cm, can carry a dish up to 36 cm diameter. It is made of 100% cotton on the polka dot side and 11 count Linen on the linen side. 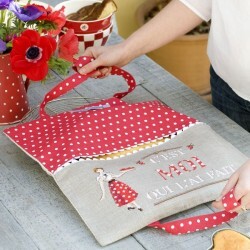 Resolutely vintage, this pie bag is perfect for carrying your home made quiche or dessert. Much more chic than a plastic bag, and more distinctly practical! The long handles make it easy to carry. To embroider on 5.5 count linen Aïda. Resolutely vintage, this pie carrier is ideal for taking a quiche or a pie to your friends houses. Much more chic than a plastic bag and much more practical! The long handles make it easy to carry.